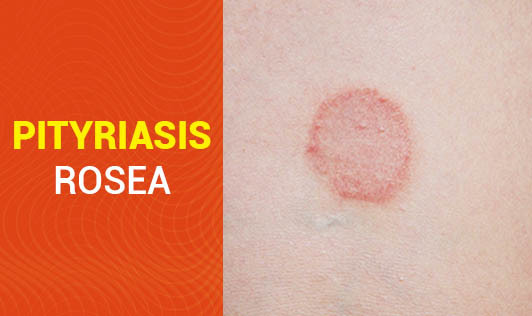 Pityriasis Rosea is a skin rash that begins as one large circular or oval spot on the chest, abdomen or back, called a herald patch. This herald patch progresses into a distinctive pattern of similar but smaller lesions that move out from the middle of your body in a shape that bears resemblance to dropping pine tree branches. Though this condition commonly occurs in the age group of 10-35 years, it can affect any age group. Doctors aren't sure what causes Pityriasis Rosea. One may have a mild headache and feel unwell just before the rash comes up or even when the rash is present and the rash can be quite itchy. The rash may take other forms such as rounded bumps, blisters and in some cases, the herald patch may not appear or two herald patches may appear close together. To relieve symptoms and discomfort, you can take an oatmeal bath or bathe in lukewarm water and wear cotton clothing. Contact your doctor if you develop a persistent rash!